Mom, the Intern: What do I do with all these $&@! papers? What do I do with all these $&@! papers? In two weeks, my kidlets will be heading back to school. I love this time of year with its new beginnings, fresh haircuts, spiffy new clothes and sharp pencils. I can just smell that brand-new box of perfectly-pointy Crayolas now! But, back-to-school also signifies the return of those dreaded piles of paper ... "Welcome Back" packets, school reminders, returned homework and projects, permission slips, you know the drill. And don't forget, you undoubtedly already have stacks of bills, coupons, receipts, and other miscellaneous sheets of paper of your own collecting somewhere in your house. And let's not even get started on junk mail. 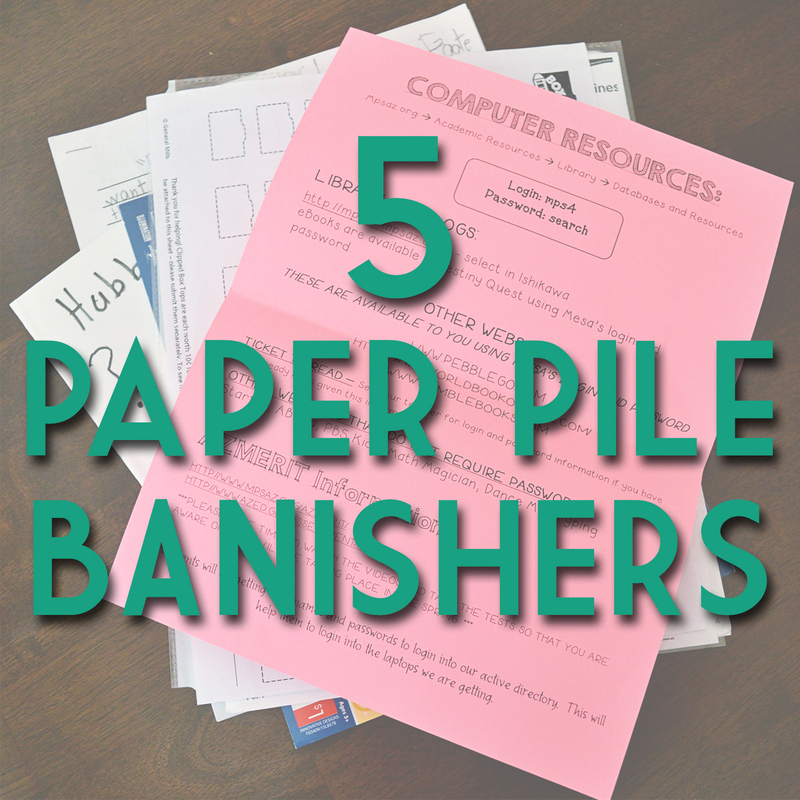 Don't be ashamed -- we all have our loose paper piles. Some of us are just better at hiding them than others. Here are five simple tricks to controlling those annoying stacks of paper that clutter up your life and drive you bonkers! I recently got so fed up with the veritable paper fire hazard in my home that I decided it was time to do something about it. I'd been using those office paper trays that stack up, but they were taking up valuable space on my kitchen counter. Plus, I wanted a method that would enable my kids to organize their papers they collect, too. I went to Hobby Lobby and found these adorable wire paper hangers for the wall next to our "command center" (what I affectionately call our computer desk). I picked up two of them so we have a pocket for each kid, plus one for the grown-ups. Here's a similar item you can purchase from Amazon if you aren't close to Hobby Lobby. Throw away the junk! This one seems so simple, but I still struggle with it at times. When you get junk mail, put it straight in the recycling bin! You've already decided it's junk, so don't make a home for it on your desk or kitchen counter. I've made a habit of looking through all the mail, sorting out the important things, and then tossing the rest immediately thereafter. Another pro tip: be sure to shred anything with identifying information on it, like credit card offers or bank statements. Use a filing cabinet. I think filing cabinets are a household necessity, right up there with a vacuum cleaner! Every adult needs one, even if it's small. Fact is, life's going to give you papers you need to keep, at least for a little while. I'm talking about interest statements, insurance documents, medical bills, warranties, or even just cute things your kids have made, and a filing cabinet is perfect for this. Just make sure to go through your files once a year so it doesn't get too full and ... well, disorganized! Scan what you can.If you've got a scanner -- and I'd be willing to bet most people do -- use it! Scan those old photographs, certificates and art projects straight into your computer, and then, throw away whatever you don't need anymore. And if you do intend to keep the original, scanning provides you with a back-up copy in case your hard copy gets lost or destroyed. Go paperless.I don't know about you, but I'm much more likely to check my e-mail than my snail mail. Yes, I'll admit that I sometimes go days without stopping by the mailbox! This is mostly because I so often check it only to find junk. I've opted to have the important documents (like bank statements and bills) sent to me by e-mail. Many financial institutions and utility providers have the ability to send you statements and bills by e-mail, and some even incentivize you for "going paperless!" This trick has really helped cut down on the amount of paper coming through my door. What about you? What tricks do you have for keeping the paper monster at bay in your home?